1907-1996 Nicknamed “Chief” by his aviation students, Charles Alfred Anderson, Sr.. served as the Chief Civilian Flight Instructor for the Tuskegee Institute ’s groundbreaking program to train black pilots. When President Franklin D. Roosevelt established a military aviation program at Tuskegee in 1941. Anderson was tasked with training the famous World War II Tuskegee Airmen. Between 1940 and 1946, he was responsible for supervising the primary flight instruction of approximately 1,000 African American pilots and flight personnel. Anderson first made history in 1932 when he and another aviator became the first African Americans to complete a round-trip, transcontinental flight between Atlantic City, New Jersey, and Los Angeles, California. 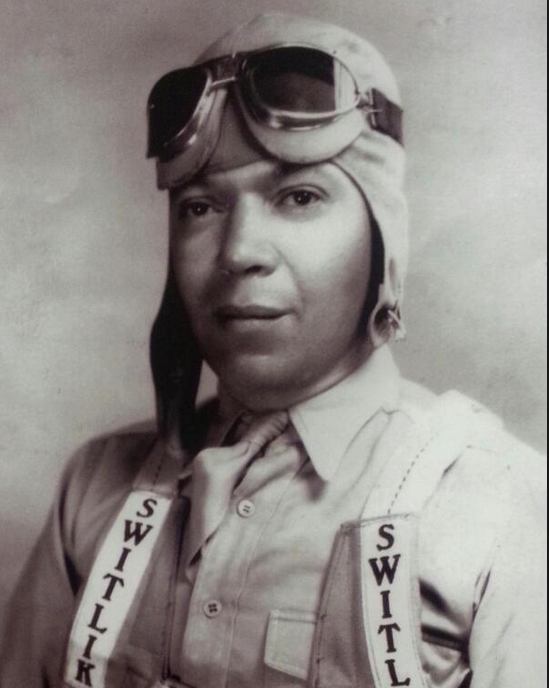 The future “Father of Black Aviation” was born in Bryn Mawr, Pennsylvania, on February 9. 1907. By age six, Anderson was absolutely fascinated by airplanes and flying. This singular passion continued to fuel his ambitions throughout his teenage years. He attempted to take flight lessons when he was 20 years old, but was unable to find an instructor who would accept an African American student. Undeterred, Anderson continued to save money, and with the help of a $2,500 loan from friends and relatives, bought a used airplane when he was 22. Although he continued to encounter a great deal of resistance from the white-dominated aviation community, he set out to train and educate himself by reading books on flight and observing professionals at local airports. Within a year, Anderson earned his private pilot’s license. His subsequent attempt to obtain a commercial air transport license, however, proved exceedingly difficult. Although he had developed all the necessary flying skills and completed the required maneuvers with proficiency, Anderson was denied a government check ride on the basis of his race. With the help of German immigrant and World War I pilot Ernest Buehl, he was eventually given an official flight check in 1932. Performing flawlessly at the controls, Anderson became the first black American to receive an air transport rating from the Civil Aeronautics Administration. His exceptional performance during his flight check caught the attention of Dr. Albert Forsythe, a black physician and fellow aviator who soon became Anderson’s partner and financial supporter. Over the next two years, the pair completed a number of record-setting flights. Their 1932 transcontinental trip from Atlantic City to Los Angeles and back again was performed without the aid of blind-flying navigation instruments, radios, landing lights, or parachutes. The next year, they completed another historic long-distance flight to Canada and staged an elaborate good will tour of the Caribbean Islands. This tour marked the first successful journey of a land plane from Miami to the Bahamas. In the late 1930s, Anderson began instructing aviation students throughout the greater Washington, DC, area. His expertise in this field ultimately landed him a position teaching civilian pilot training courses at Howard University. Then, in 1940, the Tuskegee Institute recruited Anderson to head its civilian pilot training program in Alabama. The first organization in the United States to train black pilots, Tuskegee Institute was one of six black colleges participating in a Civil Aeronautics Authority initiative to create a pool of civilian pilots to respond to wartime emergencies. When he joined Tuskegee as its Chief Flight Instructor, Anderson was the only African American in the nation with a commercial pilot’s license. The Institute was thrust into the national spotlight in 1941 when First Lady Eleanor Roosevelt made an extensive tour of the area. On meeting Chief Flight Instructor Anderson, Mrs. Roosevelt asked him about the popularly held belief that black people could not fly. In response, Anderson promptly invited her to take a flight with him over the Tuskegee campus. This 40-minute trip proved to be an enormous boon for black aviation in America. A photograph of Mrs. Roosevelt in the back of Anderson’s plane was widely circulated in publications across the United States. Within a year of the First Lady’s visit, President Roosevelt worked with the Army Air Corps to establish a primary military training program at Tuskegee. This program gave birth to the famed Tuskegee Airmen. Comprised of the 99th Pursuit Squadron, the group later combined with three others, including the 332nd Fighter Group known as the Red Tails. The Tuskegee Airmen were the first black aviators in the history of the U.S. military. Anderson was directly responsible for training the Tuskegee Airmen and preparing them for aerial battles in World War II. Over his six years as a military instructor, he and his team trained roughly 1,000 pilots, navigators, bombardiers, and other aviation recruits. After the Allied victory in World War II, Anderson continued to instruct civilian pilots and support the proliferation of aeronautical education among African Americans. In 1985, he received the Frank G. Brewer Trophy for outstanding contributions to the development of air youth in America.